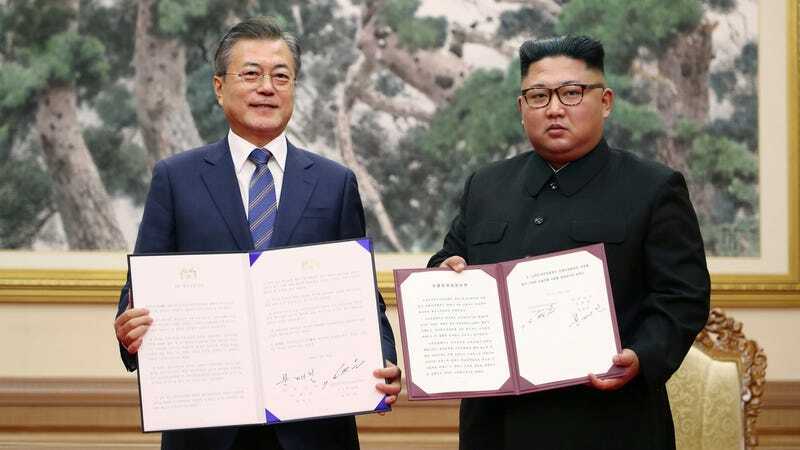 North Korea pledged to shut down one of its nuclear test sites in a meeting today between South Korean President Moon Jae-in and North Korean dictator Kim Jong Un in Pyongyang. What does the North want in return? “Corresponding measures” from the United States. Unfortunately, we don’t know what that means yet. As the Washington Post points out, the pledge is a step in the right direction, but experts caution that dismantling just one nuclear site in exchange for potentially major concessions from the United States might not be such a great deal. For instance, many on the American side would like to see North Korea declare all of its nuclear test facilities rather than offer up “piecemeal” dismantling that some see as just a way for North Korea to gain prestige on the world stage and drag its heels for more time without actually giving up its nuclear arsenal. “The world needs to remember that North Korea has other nuclear and missile facilities, and that these concession will not necessarily limit or end their nuclear or missile programs,” Melissa Hanham, a researcher at the Middlebury Institute of International Studies at Monterey told the Washington Post. “Kim Jong Un has agreed to allow nuclear inspections, subject to final negotiations, and to permanently dismantle a test site and launch pad in the presence of international experts. In the meantime there will be no Rocket or Nuclear testing,” Trump tweeted shortly after midnight. U.S. intelligence services allege that North Korea is still enriching uranium and hawks on North Korea are disappointed about the latest meeting. Republican Senator Lindsey Graham from South Carolina took to Twitter to voice his concerns. “I’m concerned South Korea’s visit is going to undermine efforts by @SecPompeo and Ambassador @nikkihaley to impose maximum pressure on the North Korean regime,” Graham tweeted late on Tuesday. Within the White House but not publicly, Trump proposed sending a tweet declaring that he was ordering all U.S. military dependents—thousands of family members of 28,500 troops—out of South Korea. But Woodward’s book doesn’t make Lindsey Graham look any more level headed than Trump. 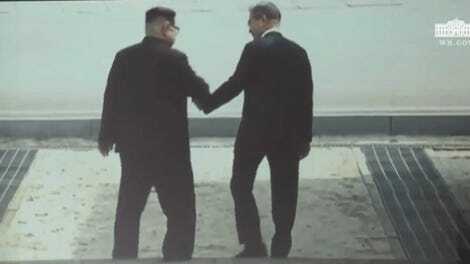 Graham reportedly encouraged the president to assassinate Kim at one point. And in a terrifying scene, Woodward explains Graham’s strategy towards North Korea with precisely what the senator is willing to give up: Namely, the people in South Korea who would be targeted by North Korea’s weapons if a war did break out.